I continued my reading of X-Men’s Age of Apocalypse saga with X-Men: the Complete Age of Apocalypse Epic Book 2 (Graphic Novel 340 pages). This collection started focusing on the different characters in the different books, compiled in chronological order from X-Men: Alpha, Age of Apocalypse: the Chosen, Generation Next 1, Astonishing X-Men 1, X-Calibre 1, Gambit and the X-Ternals 1-2, Weapon X 1-2, Amazing X-Men 1-2, Factor X 1-2, and X-Man 1. It’s interesting to see the different characterization of the familiar heroes and villains and I think the part of this entire universe that bothers me the most is the way Colossus and Shadowcat exist in this universe. Maybe it’s just harder for me because the two of them were my favorite characters while I was growing up or maybe I just view those characters with “rose-colored glasses.” Seeing Colossus and Shadowcat where they’ve given up their own hope and are the darker versions of themselves, where they “train” the younger generation under their care with violence and trickery? It didn’t sit well with me. This was originally from Marvel’s Generation Next 1, but can more recently be found X-Men: the Complete Age of Apocalypse Epic Book 2. Inside credits are listed as: created by Bachalo and Lobdell; Inker: Mark Buckingham; Colors: Steve Buccellato and Electric Crayon; Lettering: Starkings and Comicraft; Editor: Bob Harras. 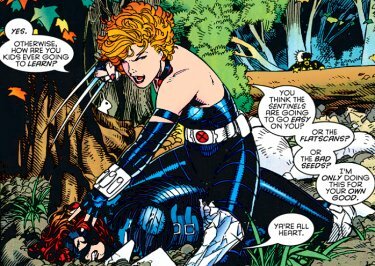 Colossus and Shadowcat were downright mean to their “students” and their training tactics were uncomfortable, at best. I used to relate to Colossus when I was younger because I felt like I understood the “poet trapped in a warrior’s body” thing. It seems to me as though most true warriors are ones who dream of quieter days; who dream quiet dreams. While at war or in conflict, many soldiers dream of holidays spent with their families; of reading bed time stories to their children, laughing on the couch at ridiculous movies, playing board games by the fire, or other “normal” activities. And while I will admit that it’s possible that my favorite characters are not as fantastic as I believed, isn’t that why we read fiction? Don’t we read fiction to believe the world is a better place than it truly is? To see the best in people and in situations? Don’t we want to be a part of a better world? The Age of Apocalypse is the opposite of all the good things you think you believe about the comic book world you grew up with. The characters whose hearts you’re so sure of have problematic flaws; flaws that you might have purposefully overlooked when you wanted to believe the best in people. So many of the characters in this story have different backstories and you wonder if they could have made as much of a difference in this altered reality as they have in the reality familiar from the comic books of my youth. Some were better and some were worse and some of the favorites continued to have their positive traits. I think there were some characters that the writers decided they wanted to use as “throw-aways”, where they did whatever they wanted while some of the favorites were ensured to still be heroes. Characters like Cyclops and Wolverine/Weapon X were given the best ability to show their heroism. Characters like Colossus and Shadowcat are shown to be less stellar than they are in the normal universe. Overall, this book both has the hope for a better world and the darkness found in situations and people when things don’t go as well as they could. The story-telling is good and the world-building is fantastic. I think this would be a solid three on my rating scale. I’m happy I own it, I’m happy I’m rereading the story, and I’m likely to reread it again in the future. The original comic books were published in 1995-1997, 2005, and 2010, from X-Men: Alpha, Age of Apocalypse: the Chosen, Generation Next 1, Astonishing X-Men 1, X-Calibre 1, Gambit and the X-Ternals 1-2, Weapon X 1-2, Amazing X-Men 1-2, Factor X 1-2, and X-Man 1. Writers: Fabian Nicieza, John Francis Moore, Scott Lobdell, Jeph Loeb, Larry Hama, Chris Bachalo, Warren Ellis. Pencilers: Tony Daniel, Salvador Larroca, Steve Epting, Terry Dodson, Roger Cruz, Andy Kubert, Adam Kubert, Mark Buckingham, Ken Lashley, Renato Arlem, Ian Churchill, val Semeiks, Tom Lyle, Tim Sale, Steve Skroce. Inkers: Kevin Conrad, Al Milgrom, Tim Townsend, Dan Panosian, Matt Ryan, Karl Kesel, Dan Green, Chris Warner, Tom Wegrzyn, Phillip Moy, Bud Larsoa, Harry Candelario, Sergio Melia, Terry Austin, James Pascoe. Colors: Marie Javins, Glynis Oliver, Joe Rosas, Steve Buccellato, Kevin Somers, Mike Thomas, Ashly Underwood, Matt Webb. Separations: Electric Crayon, Digital Chameleon. Cover Art: Joe Madureira and Tim Townsend. Letters: Chris Eliopolous, Pat Brosseau, Richard Starkings and Comicraft. Cover Colors: Avalon’s Matt Milla. Editors: Rob Harras, Kelly Corvese, Jaye Gardner, Ben Raab, Suzanne Gaffney, Lisa Patrick. This entry was posted in Book Reviews and tagged Book Review, graphic novel, X-Men, X-Men: Age of Apocalypse. Bookmark the permalink.